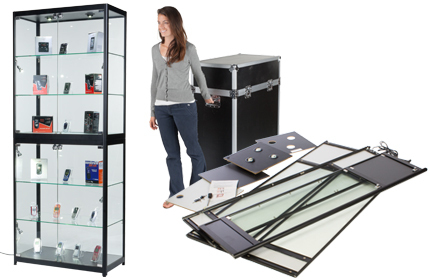 Our Huge Online Collection of Glass Display Cabinets Features the Fastest Shipping Times in the Industry! 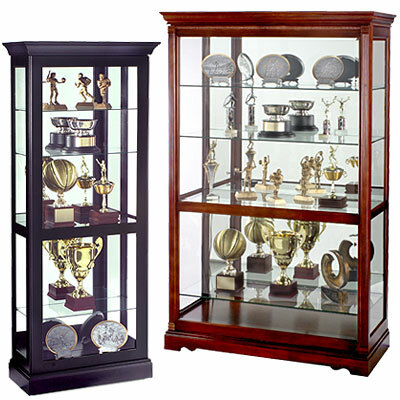 Display Cabinets Store and Protect Merchandise, Trophies, and Collections! Why buy display cabinets? The answer is twofold: to highlight merchandise or valuables while protecting them at the same time. These display cabinets, also called display showcases, fit the bill whether you are a retailer, gift shop owner, or antiques dealer. Everyone likes to present their items for sale in order to attract potential customers. 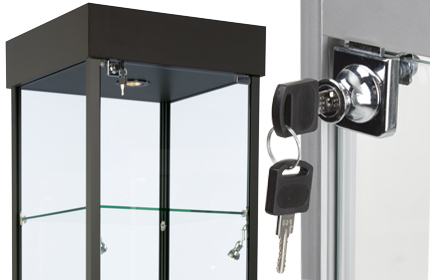 Under lock and key, you can rest assured your products remain safe. 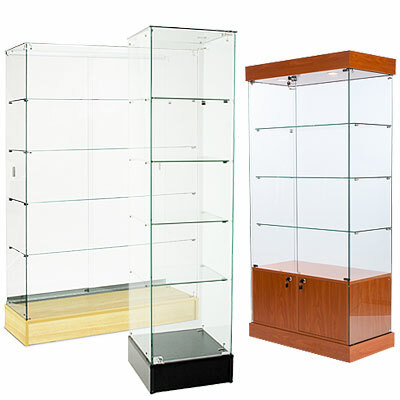 Glass display cabinets come in every style imaginable, from wall mounted cases to retail counters to small countertop dust covers. Most large models ship fully assembled by freight, however we sell many styles that ship flat. Not only do you save on shipping costs this way, you also get your fixture much faster. The main feature separating most commercial display cases is whether or not you want interior lighting. Beyond that decision, the rest of their features fall into personal preference. Both contemporary and heirloom (meaning curio) cases are available. Models with glass all around are meant to be viewed from all four sides. They feature minimal framework with an emphasis on full vision. 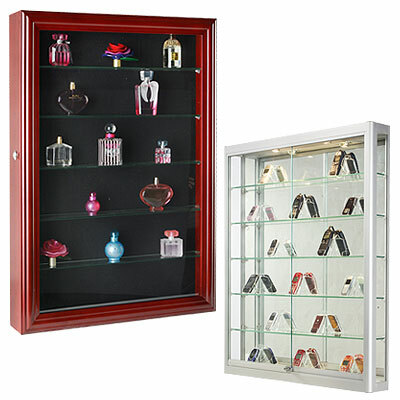 Showcases with solid or mirror back panels are better displayed against walls. If you plan on purchasing a fixture to highlight family heirlooms then it would be advisable to go with a handsome solid wood curio cabinet from Howard Miller instead of a modern retail model. Our selection includes ornate wood mouldings in a variety of stained wood finishes. 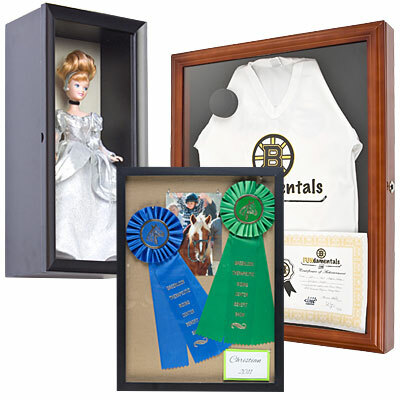 Show off trophies, collectibles, or sports memorabilia! Which display case is right for me? 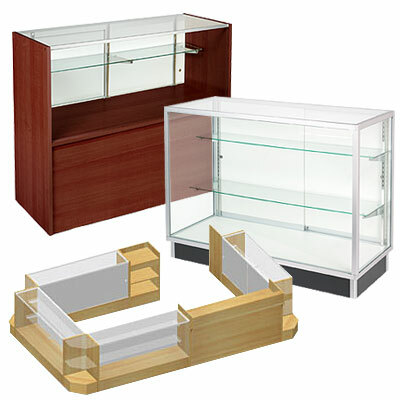 Display cabinets with glass on all four sides are the top choice for retailers and store owners. They are typically placed in the center of rooms and allow for 360° viewing. Corner units and fancy solid wood curios are designed more for the home. 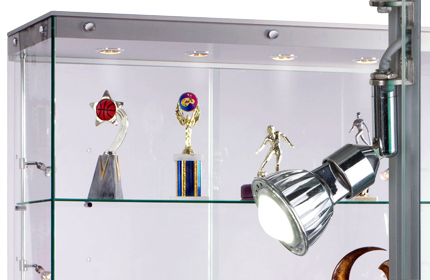 For the displaying of trophies and awards, select a case with interior lighting. Pedestal styles are standalone fixtures that highlight single objects or a small grouping. These are usually seen in museum settings and upscale jewelry stores. 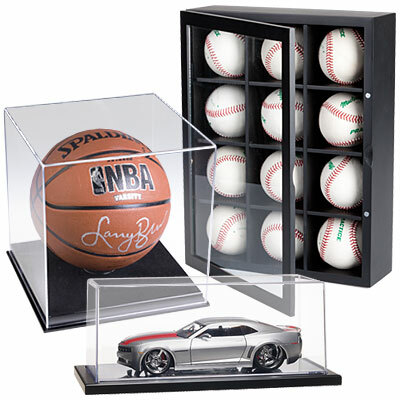 Small countertop cases offer simple acrylic domes with wood bases that keep dust and dirt off models or signed sports balls. There is a wide spectrum between the various sizes of fixtures strictly for commercial use. The company stocks narrow towers that are big on display area while incorporating a small footprint. Extra wide models offer large amounts of storage space that come as big as entertainment centers. Most displays come with or without interior lights, either attached to the frames or re-positionable on sliding track systems. Retail counters feature adjustable shelving with lockable areas beneath for storing items out of sight. These store counters are some of our best sellers and come in a number of plastic laminate finishes, including black, silver, cherry, and maple. Our selection is unparalled and we provide the quickest freight shipping times in the industry! Specific models ship via freight in as little as 4 days (compared to 4 weeks like some other suppliers). What are the benefits to using glass showcases? They protect and display valuable merchandise and fragile keepsakes at the same time. Merchandisers can present their products in the best possible light safely. Wide selection of floor-standing or wall-mounted models offers the most display options. Designed for professionals and homeowners alike. 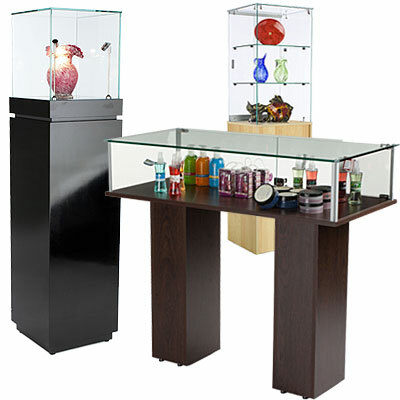 We specialize in quality glass showcase furniture for sale to fit every application. The company is an authorized dealer for Howard Miller and features 4 day lead times on select models. If you have questions about trophy cases or commercial counters, product features, shipping or receiving requirements (such as loading dock capabilities), feel free to call us at 800-572-2194. You can also use the online CHAT feature located on the home page and on every page on the website. Customer satisfaction is our goal! 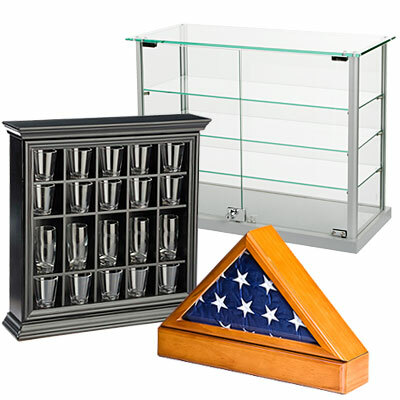 Purchasing glass display cases is a big investment; take the time to familiarize yourself with our products and if you have questions, we can help. Shop with us today!